It has been a very long time when I shared the Part I; now it’s time to keep sharing you all best social media icons, social network icon I found. 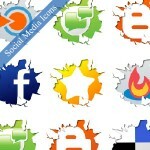 There are many social icon sets available on around the Internet. If you’re a web designer/web developer and you want to create some beautiful social icons for your computer or website, you can get plenty of such designs; then this is the right post for you. Let’s go through a wide variety of wonderful designs about social icons on around the Internet. All social icon sets presented below are the lastest versions, you do not have to find from other sources for updates; and they’re are FREE for commercial and personal use on your websites, web applications, software applications, print designs, and other works; but you must follow the Creative Commons license. … in the next posts. Let visit (9) Nice Blog Tips & Tricks regularly to get a lot of tips and tricks for your road of blogging. Or stay connect connect with us via RSS to get more cool social icons if you like this post. Do not forget to sign up your email (see on top) to get our latest updates. Hope you also like the collection in this post, now click here (177 MiB) to download all 21 free social icon sets.